Habit: Rhizome creeping. Stem: erect, simple . Leaf: alternate, generally +- clasping, lower reduced to sheathing scales. Inflorescence: terminal, raceme to panicle. Flower: perianth parts 4 or 6 in 2 petal-like whorls, white; stamens 4 or 6; ovary superior, chambers 2--3, style 1, stigmas 2--3. Fruit: berry. Seed: 1--3. Species In Genus: 3 species: northern temperate. Etymology: (Greek: May flower, from flowering season) Note: Historically divided into 2 genera, Maianthemum, Smilacina (1. vs 1' in key); otherwise +- equal morphologically, unique chromosomally. Habit: Rhizome 5--10 mm diam. Stem: 30--90 cm, glabrous to finely hairy above. Leaf: > 5, 7--20 cm, ovate to oblong-elliptic, acute to acuminate, glabrous to finely hairy abaxially; petioles +- 0. Inflorescence: panicle, 5--12 cm; flowers > 20. Flower: perianth parts 6, 1--2 mm, << stamens, +- erect, narrowly oblong; ovary chambers 3. Fruit: 5--7 mm, red, dotted purple. Seed: 2.5--6 mm, brown. Chromosomes: n=+-18. 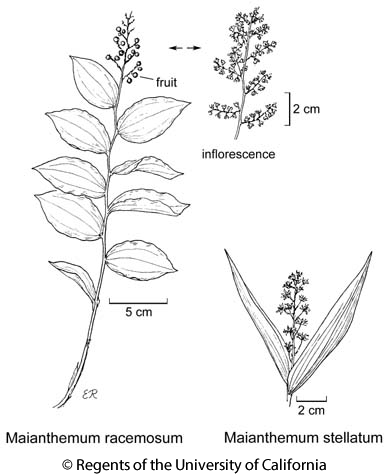 Citation for this treatment: Dale W. McNeal 2012, Maianthemum racemosum, in Jepson Flora Project (eds.) Jepson eFlora, http://ucjeps.berkeley.edu/eflora/eflora_display.php?tid=32495, accessed on April 19, 2019. NW, CaR, SN, CW, TR; Markers link to CCH specimen records. Yellow markers indicate records that may provide evidence for eFlora range revision or may have georeferencing or identification issues. Purple markers indicate specimens collected from a garden, greenhouse, or other non-wild location.